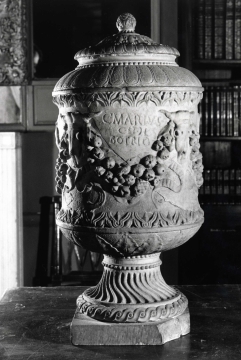 This vase may be of questionable date. 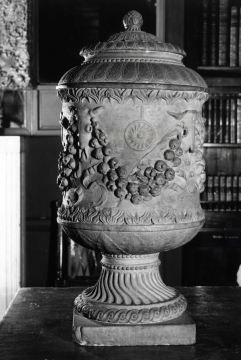 It is possible that the body is Roman but the lid and section between body and pedestal are 18th century. 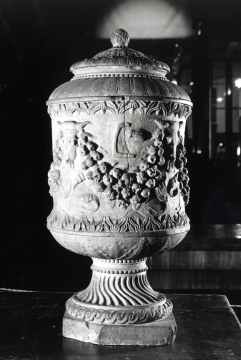 The whole piece may be a product of one of the 18th century Roman workshops producing elaborate fakes for the Grand Tourist market. 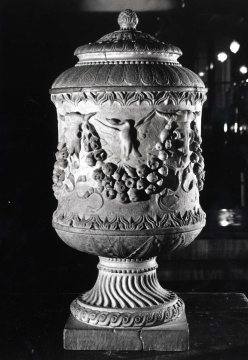 Rome; purchased by Soane at the Adam Sale in 1818, as part of lot 96. Corpus Inscriptiorum Latinarum, VI, III, 22189. Robert Adam: the Creative Mind, exhibition catalogue addendum for Frick Collection, 1997.